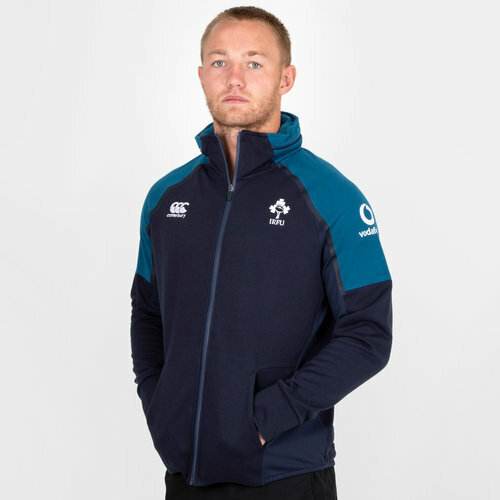 Whether it's out and about, in training or at the Aviva Stadium, make sure you look your best in this Ireland 18/19 Hybrid Full Zip Hooded Rugby Sweat from Canterbury. Elasticated cuffs and waistband make for a comfortable fit, complete with a hood and drawstrings with a kangaroo pocket for a practical hoodie. The Ireland full zip sweat comes in a high performance fabric, for a great look without compromising functionality. This sweat is predominantly navy with light blue on the sleeves. The CCC logo and Ireland Shamrock have been embroidered onto the shirt on left and right, respectively. The team's partner, Vodafone - a collaboration since 2016, is embroidered on the left sleeve. Keep it fresh in this Ireland Hybrid Full Zip Hooded Rugby Sweat.